Supporting therapy during a water fast will enhance and deepen the potential results during the process. 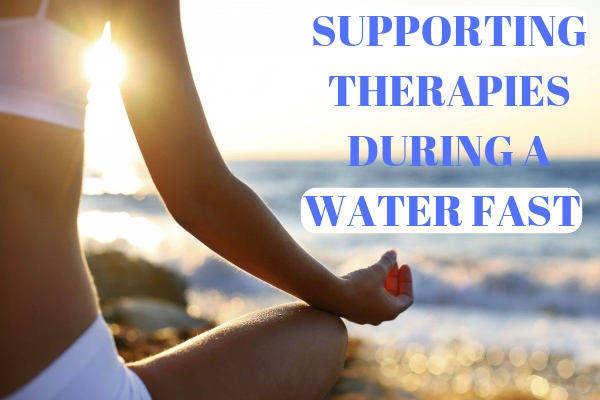 Let’s look at supporting therapy during a water fast. During the first few days of your water fast continue to do what you would normally be doing. The “normal” things we are talking about are going to bed early, getting up early, meditate, read and the workouts we do routinely. These things should be completed by 6:30 am. If you committed to going to bed early, you can easily accomplish all of this by 6:30 – 7:00 am in the morning. This would include meditating, reading good books on health and healing and working out. In terms of working out, it doesn’t need to be extreme. It can be as hard or as easy as the routine workouts you would normally do for the first five to six days of the water fast. The Bemer machine should be included in the protocol. The Bemer is a mat you sit on for eight minutes at a time and preferably twice a day every day. This machine emits a frequency that will open up the microcirculation in the body. The microcirculation accounts for seventy percent of the body’s total circulation. This is very beneficial for the arteries and veins throughout the body. The microcirculation helps support the bodies organs and cells which is very important to maintain good health. Most of the population today has a very sluggish circulation so this therapy is very beneficial. Yoga is an excellent activity to do while water fasting. And to complement the yoga, there is pranayama breathing. This also helps to cleanse our lungs. The most important aspect of fasting to remember is that we have stopped toxifying our bodies. Water fasting prevents toxins from being put into the body. This is when the body is free to cleanse very deeply. Breathing deeply during a water fast is important as well and should be a focus. To do a complete body cleanse while water fasting or green juicing, air needs to move in and out of our lungs. Adding colon hydrotherapy to cleanse and flush out the colon is essential as well. If you can, doing two colonics over the first 7 days and then one a week over the next several weeks is what you should try and accomplish. After the colonics, doing enema’s every month for health maintenance is key. When it comes to reading, choose books where the subject matter is centered around health and health-related topics. Choose books to read where the subject in on water fasting, green juicing, yoga, infrared sauna’s, etc. Learn from experts on these subjects and see what thousands of other people have done as well to improve the health. This will help educate you and further reinforce your goal of health restoration and then maintaining your good health.